(Boston, MA) A Winter Gathering of New Music & Multimedia Performance is an intimate multimedia salon theatre experience. It’s a concert with dramatic sketches. It’s a lot of things including unusual, fun and experimental. The 90 minute event begins with Thread Ensemble’s “A conversational/musical interlude on home.” Audience members were asked about several questions on “home.” Written answers were turned into music by members Andria Nicodemou (vibraphone/percussion), Rachel (violin) Panitch, and Abigale Reisman (violin). It sounded like improvisational John Cage-y movements set with spoken word poetry. Thread Ensemble performed them well: they maintain excellent ensemble with each other; Nicodemou use a bow to make her vibraphone sound like a glass harmonia; the colors painted with their instruments imply great range. But, such contemporary-sounding classical music is not to all tastes. Their style was untraditional. “nostos/ algos” is a dance, poetry piece that extends beyond definition because it includes so many art forms. It discusses through motion, voice and still art what it means to be in America around distrusting, xenophobic white Americans. While it is generally successful, it’s message is significant, the players don’t watch each other enough. The parts of this piece that worked the best unified the performers. As the music by Asha Tamirisa plays, Maurice Decaul and Juwon Jun engage in reactionary dancing. He mimes pushing and pulling her body, and she responds from several feet away. Had Decaul waited for Jun’s body to come to a natural rest between push and pull, this choreography would have been more effective. Instead, it looked as if the performers were on different planes. “Alone Together” and “River Rising” are two compositions by Kirsten Volness. On this evening, EmmaLee Holmes-Hicks played both with elegance. Volness’ first piece live loops Holmes-Hick’s violin solos with pre-recorded electronic music. It is pleasant but ends unexpectedly. “River Rising” is a dramatic sound dialogue that engages the ear with a more classical sound. It tells a story with the violin that begins plaintive like whale song that winds into violence. It isn’t a hummable tune but it is beautiful. The last offering of the evening was Adara Meyers, “Picture This.” It is a strikingly personal look into the emotional experiences of the playwright through choreo-poetry. The stage is set with suitcases which represent unpackable emotional baggage. Cell phone footage presents Meyer’s fresh-faced vulnerability. 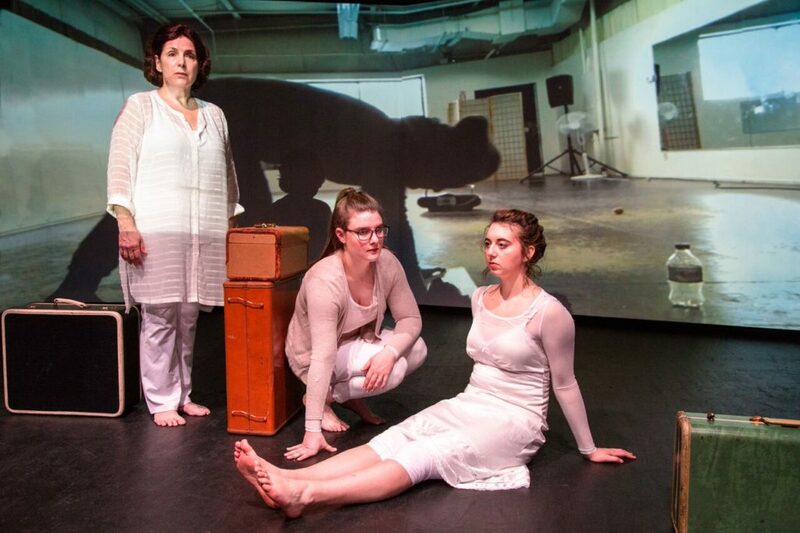 Blair Nodelman and Veronica Anastasio Wiseman play a spectrum of female relationships. It’s the kind of short play that had the women in the audience sounding “Mmmm” in unison at poignant moments. If that isn’t a trophy of honesty from a female-dominated audience, I don’t know what is. A Winter Gathering of New Music & Multimedia Performance isn’t the kind of concert to shake one of the doldrums. Rather, it’s proof positive that winter’s forced confinement can reap great benefits for the introspective. Artists can make art from anything. This entry was posted in Concert and tagged 2018, A Winter Gathering of New Music & Multimedia Performance, Adara Meyers, boston center for the arts, Charlotte Meehan, EmmaLee Holmes-Hicks, February, Sleeping Weazel by Kitty Drexel. Bookmark the permalink.